My kids love to do hands on science experiments at home! There is something so empowering about causing a reaction in an experiment or suddenly grasping a science concept. It gives kids confidence as a learner and is just plain fun! 1. Air Pressure Experiment: Make it easy for kids to see how air pressure works with this fun activity from Kids Activities Blog. 2. Floating Egg Science Experiment: Fantastic Fun and Learning experimented to see what would make an egg float and sink. 3. Does it Dissolve Science Experiment: We pulled items out of the pantry to test which ones would dissolve in water. 4. How to Make Square Bubbles: Teach Beside Me used pipe cleaners and straws to make square bubbles. 5. Cornstarch and Water Science Experiment: The classic is a liquid or is it a solid (or both!) messy science activity from School Time Snippets. 6. How to Make a Cloud in a Bottle: We made an actual cloud appear in a bottle! This one definitely makes an impression on kids. 7. Fireworks in a Glass Experiment: Science Sparks is full of fun science activities like this fireworks in a glass experiment. 8. Lime Juice and Baking Soda Experiment: Acid-base reactions are a childhood must do! Instead of the classic vinegar use lime juice! A new twist on an classic experiment that smells great. 9. Color Spray Science: Kids Activities Blog’s art and science activity that you can wear is perfect for kids of all ages. 10. Adrenalin Science Activity: This representation of how adrenalin works from Highhilll Homeschool is hands on and fun! Science is so much fun! Find a fun experiment to try today! Just wot was looking for we are havin November as science month in my service… Thanks. 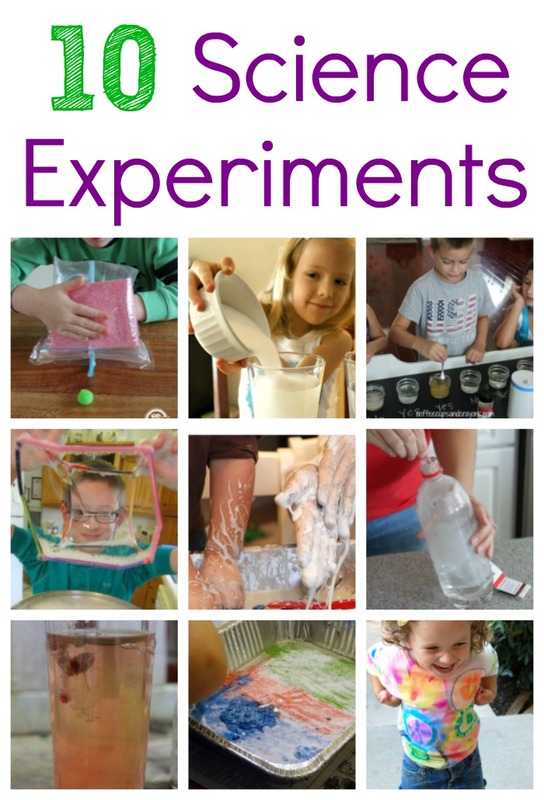 Love these experiments – all so much fun for kids, and educational!!! What a bunch of fun experiments to do after school and beyond! Thanks so much fro including our firework.